Improving food safety through the generation of data to improve quality. Alibaba’s signed an agreement with a Chinese food conglomerate that raises 10 million pigs each year, to deploy facial and voice recognition on pig farms.Using image recognition, software will identify each pig. This corresponds with a file in a database, which tracks characteristics such as the pig’s breed type, age, and weight. The software can monitor changes in the level of a pig’s level of fitness. The software will assess which pigs are most capable of giving birth to healthy offspring. Alibaba is best known-as China’s largest e-commerce company, but it’s lately made forays into artificial intelligence and cloud computing. Through a program it calls ET Brain, it’s using AI to improve traffic and city planning, increase airport efficiency, and diagnose illness. The company’s latest AI foray is taking place among pigs. Alibaba’s Cloud Unit signed an agreement on Feb. 6 with the Tequ Group, a Chinese food-and-agriculture conglomerate that raises about 10 million pigs each year (link in Chinese), to deploy facial and voice recognition on Tequ’s pig farms. According to an Alibaba representative, the company will offer software to Tequ that it will deploy on its farms with its own hardware. Using image recognition, the software will identify each pig based on a mark placed on its body. This corresponds with a file for each pig kept in a database, which records and tracks characteristics such as the pig’s breed type, age, and weight. The software can monitor changes in the level of a pig’s physical activity to assess its level of fitness. In addition, it can monitor the sounds on the farm—picking up a pig’s cough, for example, to assess whether or not the pig is sick and at risk of spreading a disease. The software will also draw from its data to assess which pigs are most capable of giving birth to healthy offspring. Tequ’s CIO stressed that taking care of pigs is no easy task for large pig farms. 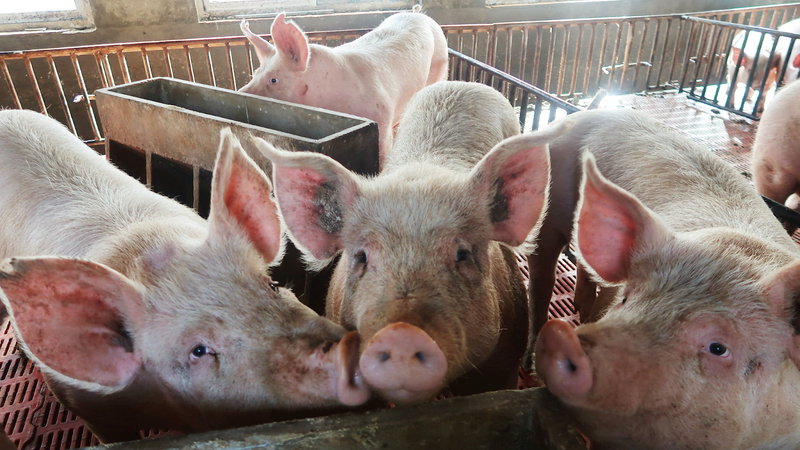 “If you have 10 million pigs, relying on manpower is already not enough,” he said (link in Chinese), according to a report by local publication Tianxia Wangshang, adding that it’s impossible to manually count each pig given how many are born every day. Alibaba told Quartz that the software is currently in use at some of Tequ’s farms already. China is the world’s largest supplier, consumer, and importer of pork. The country produced 53.5 million (.pdf) metric tons of pork in 2017, and since 2007 has kept a pork reserve that it uses to control pork prices (paywall).